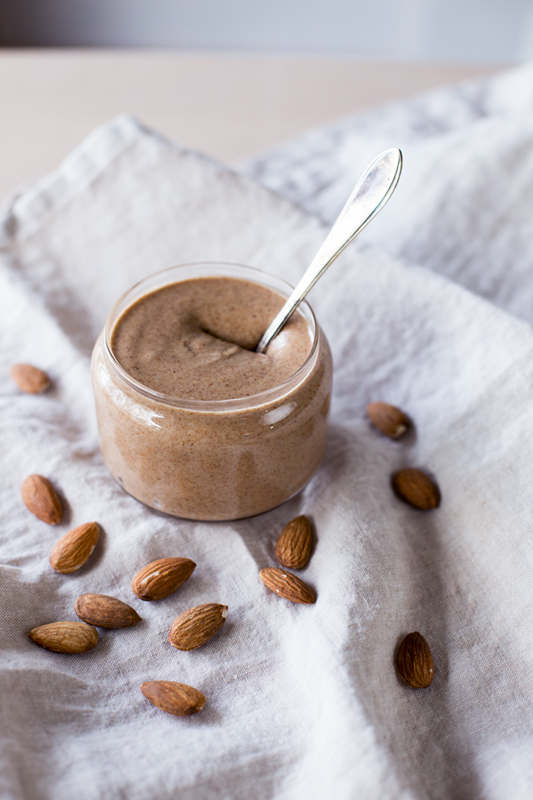 Almond butter is probably my favorite ‘healthy treat’. You know the one that you give yourself permission to eat wholeheartedly as it’s just so good for you? Well, almond butter is my weak spot and me standing in front of the fridge eating almond butter straight from the jar is a pretty normal sight in our house. Whoops. I must admit that most of the times I buy my nut butters from health stores as it’s just so easy. It’s expensive, but easy. Luckily making your own nut butter is easy too, it just takes some patience. And you also get to taste it a few times while making it, which makes the whole process lot more delicious. 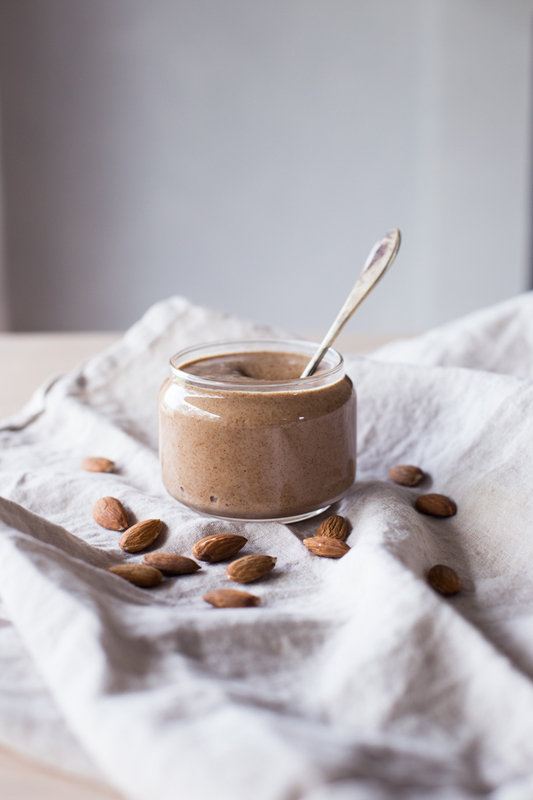 I make my own almond butter from oven roasted almonds, as I like the taste of roasted almonds. I also add a bit of salt too to give it a nice twist. Other spices would work well too, especially cinnamon and vanilla. 1. Heat the oven to 350 F / 180 C. Roast the almonds for about 7-10 minutes, or until they’re clearly roasted. Be careful not to burn them. 2. Let the almonds cool. Once they’ve cooled, add them into a blender or a food processor. Blend until a crumble forms, then turn to high and use the tamper to press down the nuts, until they become creamy. Blend until you get a smooth texture. You might have to let the belnder / food processor rest while making this, if it starts to heat up. 3. 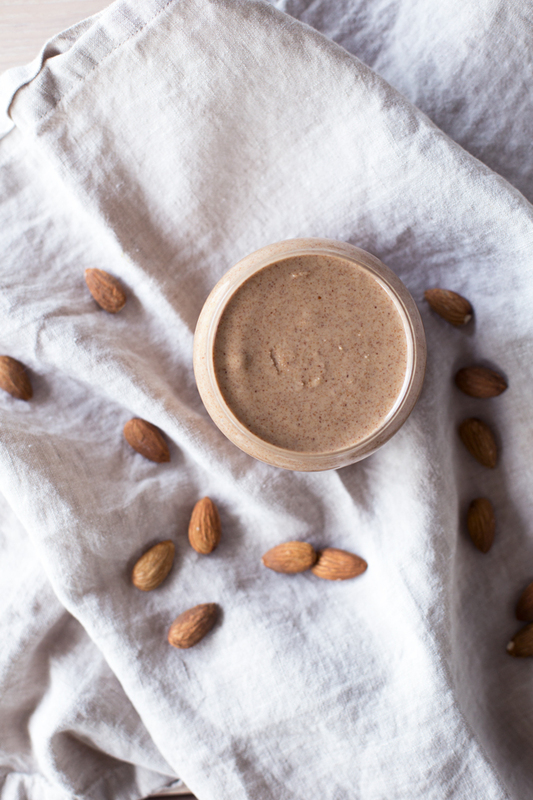 Pour the almond butter into an airtigh glass jar, let cool and store in the fridge.